Barry and I laughed out loud at this quote a few weeks ago; and then earlier this week I reminded him of it as it applies so pertinently to our lives at the moment. What a great way of realising that in fact life and its ups and downs, forwards and backwards is really just a dance. And which dance doesn't ever really involve one of the partners taking a backwards step at some point? A great metaphor I have figured and great wisdom I think. I popped over to read Robert Brault's blog and it is full of quotes and lines about life in general. I think this holds true in our art and creative lives as well. So often we figure a disaster is a disaster. Something we attempted and failed. Something that just never fully realised all the potential we had for it in our heads. And yet, I expect with a bit of distance and time, we can recognise that sometimes these failures brought with them gifts. We took a step backward so we could work out where to go next, or we learnt how NOT to do something, and where to put our feet next time. It's amazing to me how a simple thought or idea, expressed like this, can change my approach to a situation. 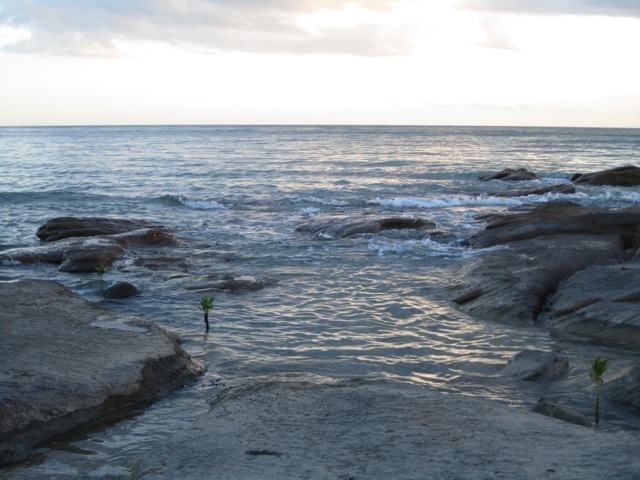 This photo (taken at Alyangula last year) reminded me how the tide comes in and goes out - it too goes backwards, and then comes forward. 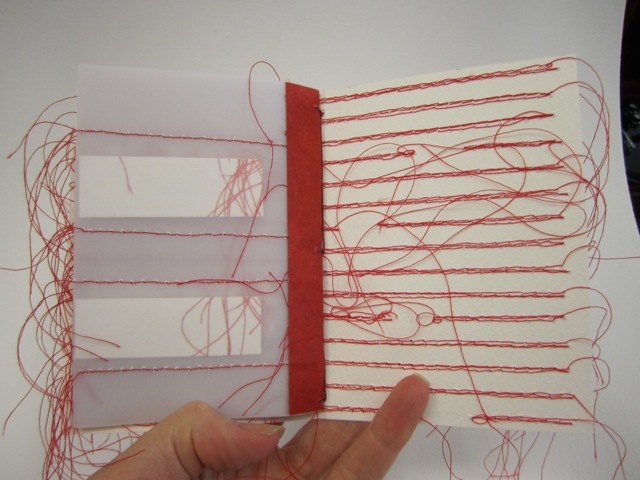 The second book in my bookartobject project this year has also gone out into the world and I can now talk about it a bit. I am also beginning to receive a couple of other books from some folk in my groups so I shall share those soon as well. I think I chose this title because I love the look of white on white – which is how I imagined the world might look when snow fell in daylight. 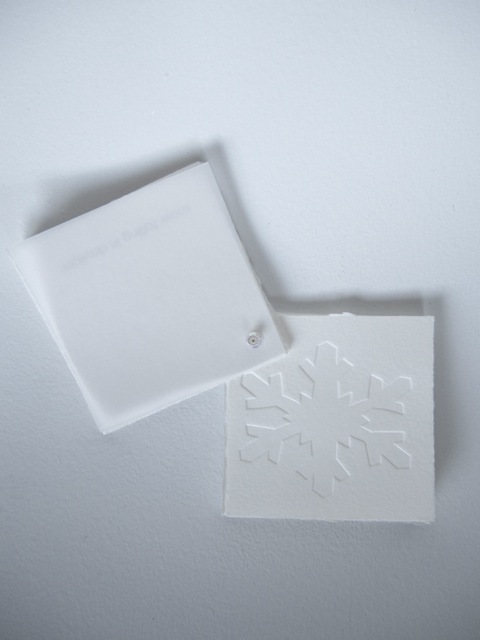 I embossed and debossed snowflake images I created myself and stacked them as I thought about how they fall and pile up. 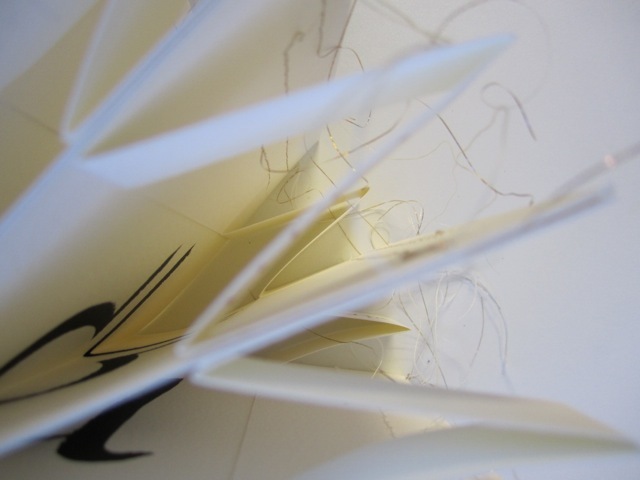 I left the edges of the pages a bit frayed – like the feathering of snowflakes, and I knew I wanted to have a really delicate, loose binding that gave the sense of the fragility of the snowflakes – not something rigid and bound. 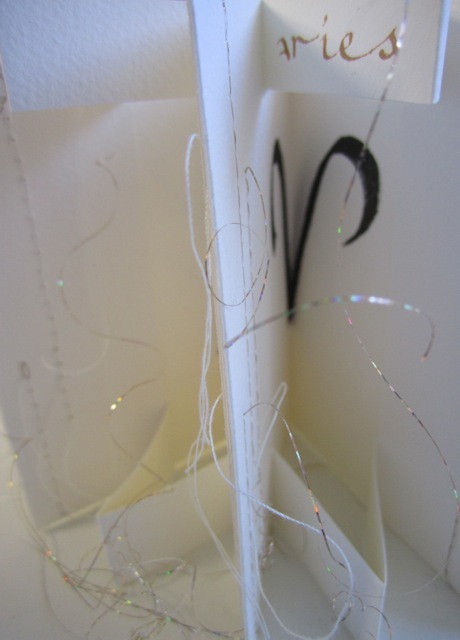 The Swarowski crystal set atop the book continues the sense of frailty and delicacy. 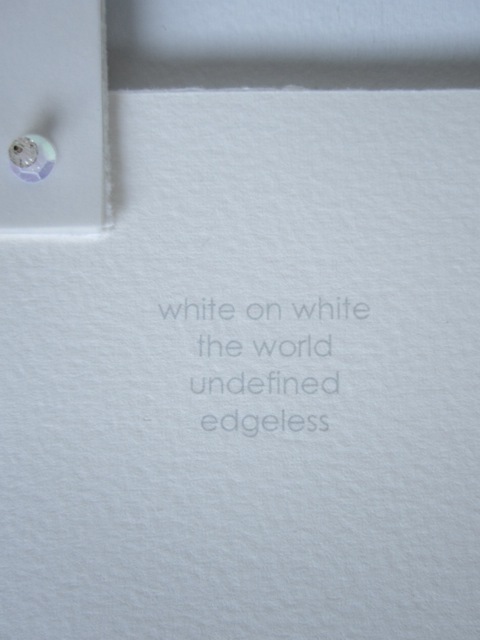 The words in the middle are mine – again, how I imagine the world might be in daylight snow. 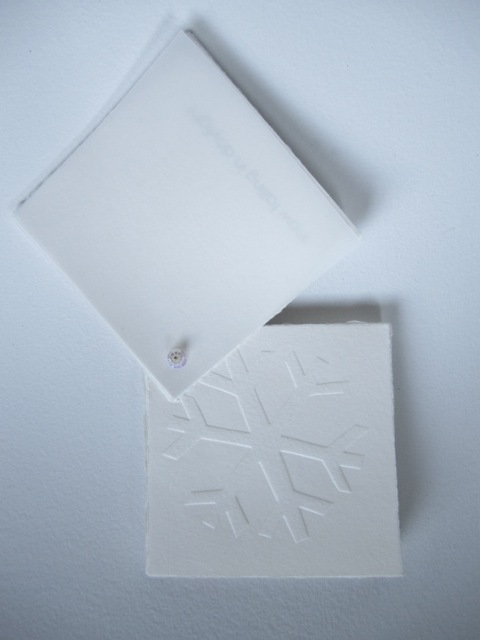 In the end, it’s a little book of snowflakes. 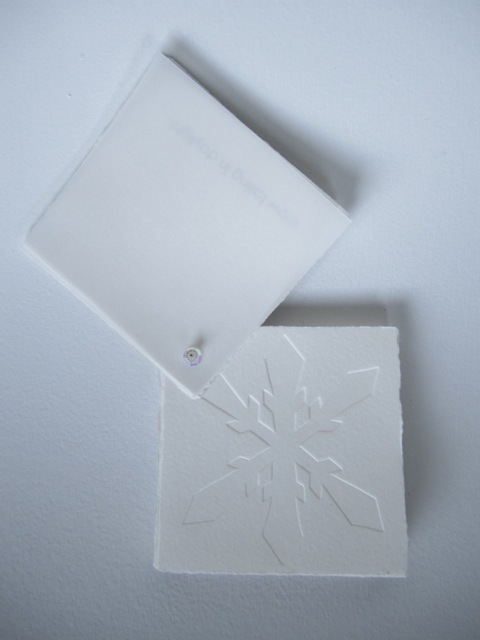 It is quite small, the squares are only 8cm x 8cm and I made an edition of twenty, so I have some spares for swapping, or for selling through the studio. Thank you for all the care and support for me and for Barry during this tough time. Sadly, he went backwards on Friday and was transferred back to a major hospital in another town nearby. He is taking slow and little steps forward. It's been a tough week in the Dempster-Smith household. Barry got an infected heart covering (pericarditis), which caused him great pain and trouble breathing. An episode in Emergency meant he needed to be resuscitated with CPR, and he has since managed to get very damaged ribs, a collapsed lower left lung and possibly pneumonia. He is back in hospital for a bit, at least in Maleny this time, and getting excellent care and attention - and pain management. Quite the time I must say! For those who have known and sent him care, support and positive thoughts I say thanks. I never feel really sure about doing the personal versus the art thing on the blog, but I figure my absence from commenting on other's blogs, slowness in replying to comments people are making on mine, and my short but sweet posts probably need a bit of explanation. The opening sentence of this quote pretty much describes me at the moment. Don't think! But I really do like it as it applies to making, creating and doing. I find it's a funny old conversation you can have with your head when setting out or working your way thru a piece. Sometimes I don't think and it just appears - Patti calls that "thinking with my hands". Sometimes I have a little quiet conversation with a friendly muse who hints, guides and send me down the right paths - again I'm not really thinking, just responding. It's when a conversation starts that I'm in real trouble when I start over-thinking, second-guessing, almost arguing against myself and my ideas at times such that the pieces get really muddled and lose their way. So often it seems to be about getting out of the way of yourself and letting the piece emerge. I often think a lot before I begin - thinking still offers me a sense of comfort that I am at least doing something, and I have a plan (love a plan, like a list). 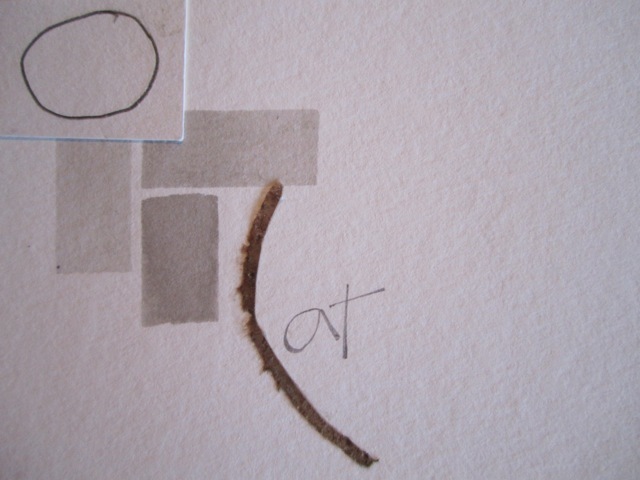 Even if the piece deviates completely, I still like that bit at the beginning. And just because I'm still a little bit in love with it, and it was a good example of NOT over-thinking, but responding, here's another glimpse of Seeking Solitude. Thanks again for all the care. 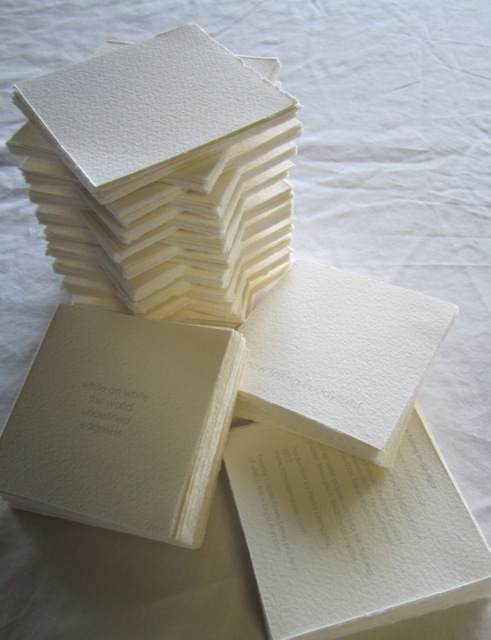 I have sent these little books out into the world and they appear to have reached their far-flung homes so it seems safe now to talk about the process and the finished product in a bit more detail. 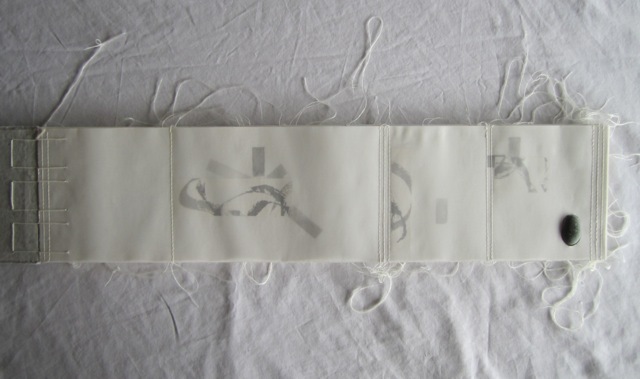 The story behind BookArtObject this time around is that Sarah Bodman wrote 100 short stories based on Kurt Johannessen's book Exercises, where one of the tasks was to write 100 stories and bury them in a forest", which she duly did. If you want to know more, you can follow this link... Each story had a title, (the full list is here) and we were able to nominate which one we would interpret. 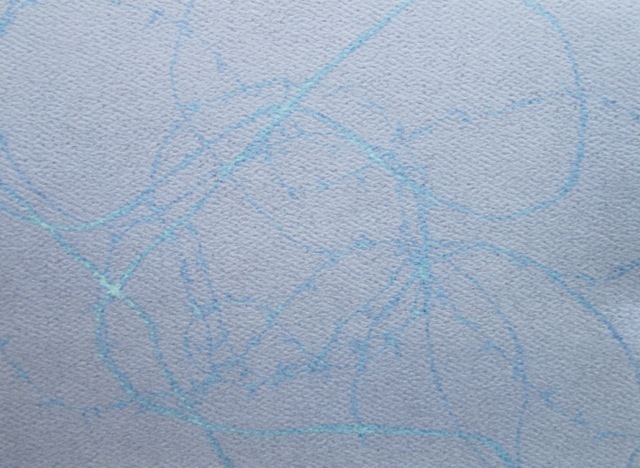 I chose first of all "A subversive stitch", and secondly "snow falling in daylight". With no idea what the real short story of that title is like, I headed off with an open mind. 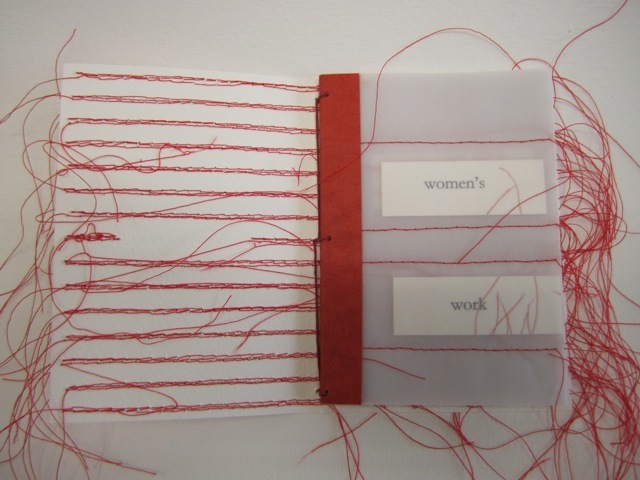 My mind wandered across several different thoughts and approaches for this book and I settled on a combination of ideas around women's work and stitching, darning, and embroidering; about censorship and letters written home during the wars where sentence were blacked out, leaving the safe words showing; about stitching to remove words and leaving others; about history where men mostly got to write it and women weren't featured. Quite an amalgam. 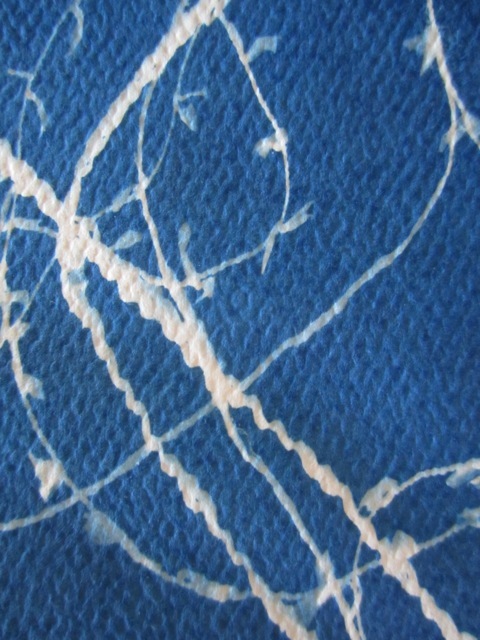 I machine-stitched the words away on the cover, leaving the important ones behind, with threads dangling madly everywhere. 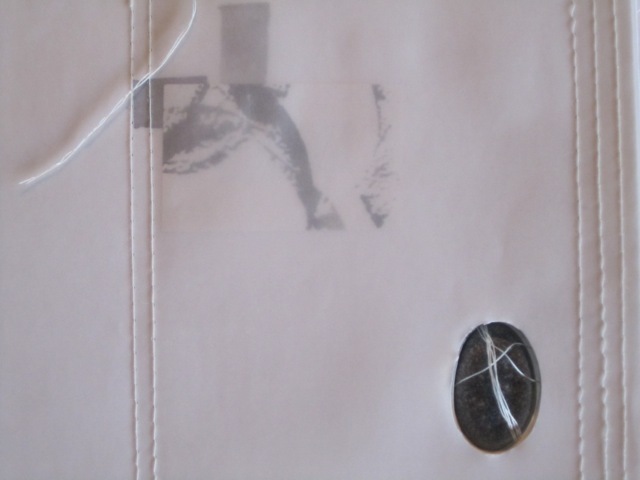 On the inside pages, the words are sealed in place and can’t be easily removed or erased; and yet the tracing paper makes it a bit hard to discern what is written. 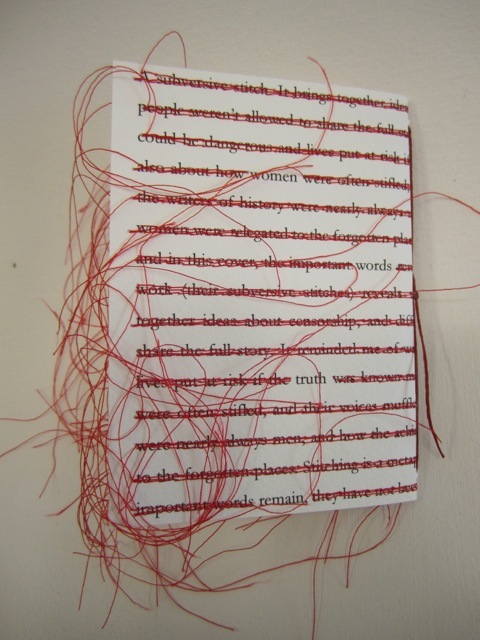 The words are printed on paper where I had also printed an image of the threads off all the covers. All of the words I used are my own. I am finding it much more satisfying these days to either work with my own words, or those of people I know, rather than than simply working with someone famous' words. 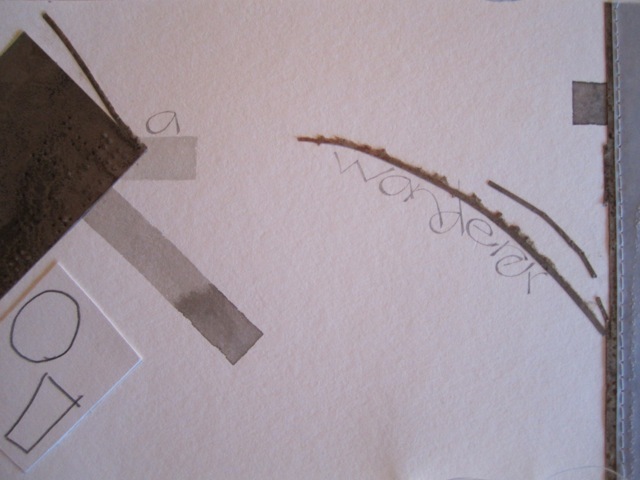 I still love working with others' words, but my own words are beginning to add another dimension to my work I think. Here is the book from front to back. 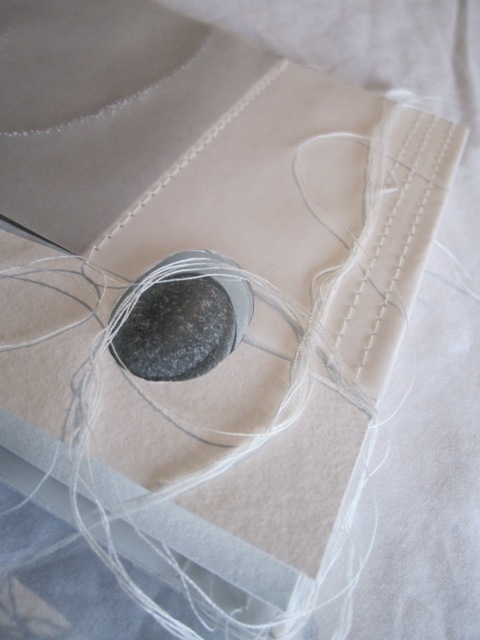 Given so much of my work is quiet, subdued and uses a simple palette - this was a very liberating and exuberant book to make. 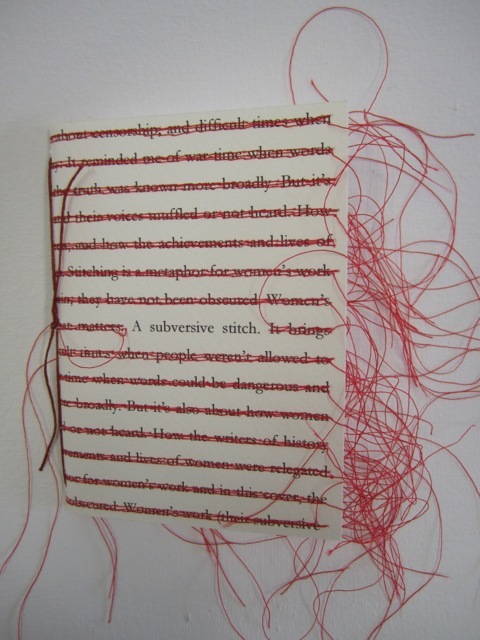 I loved the mess of the threads, I loved the boldness of the colour, and I loved the messages. 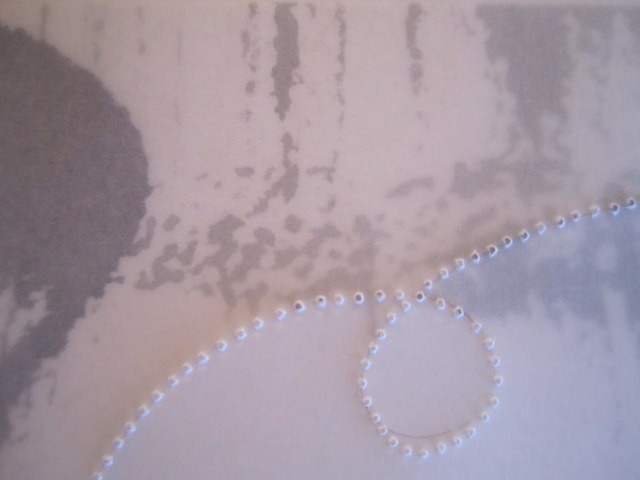 A lot of my work is about quietness, peace and gentleness; yet this piece has a bit of the feminist in me in it which I thoroughly enjoyed expressing! "Until then I had thought each book spoke of the things, human or divine, that lie outside books. 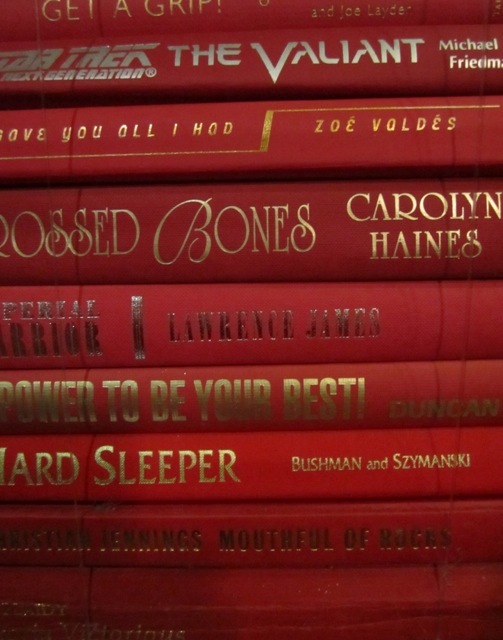 Now I realized that not infrequently books speak of books: it is as if they spoke among themselves. In the light of this reflection, the library seemed all the more disturbing to me. It was then the place of a long, centuries-old murmuring, an imperceptible dialogue between one parchment and another, a living thing.."
There won't be much thinking tonight on Thursday Thoughts, but I did want to connect a little bit to Jennifer's blog where she is searching for a rainbow on the third Thursday of every month, starting this month with red. So with this quote in mind I photographed part of my rainbow book stack and it got me thinking that these titles would lead to some very funny and entertaining conversations between the books when I have gone to bed! Barry and I have been beavering away here and there, now and then, to try and update our websites. We like the idea that they are a place where people can see the best of our work, and get a real sense of who we are and what we do. We haven't been particularly good at the updating thing we realise, but in the past few weeks have spent many hours uploading new photos, re-arranging the 'portfolios' of work and generally freshening things up. What has been really good about doing this, is that we are now both quite comfortable and familiar with the software. I think one of the things that kept us from updating was that we weren't all that confident; so we didn't, and we didn't keep improving our skills so we could feel more confident...and so the silly cycle went on. But now we both feel confident to go in and do a quick tweak or add another image and that feels good. Almost as comfortable as blogging! Another nice thing about talking about the website and what would go on it, was that it really clarified for us who we are and what we do. What are we known for? Where are our passions? How does our work come together in a group or collection? We talked as we drove to Goondiwindi and back (twice), we talked on our morning walks, and we talked over a glass of red at the end of the day. It was a really helpful process to clarify things. So please pop on over to my website either here or through the link on the sidebar and see what you think. Barry's website can be viewed here. 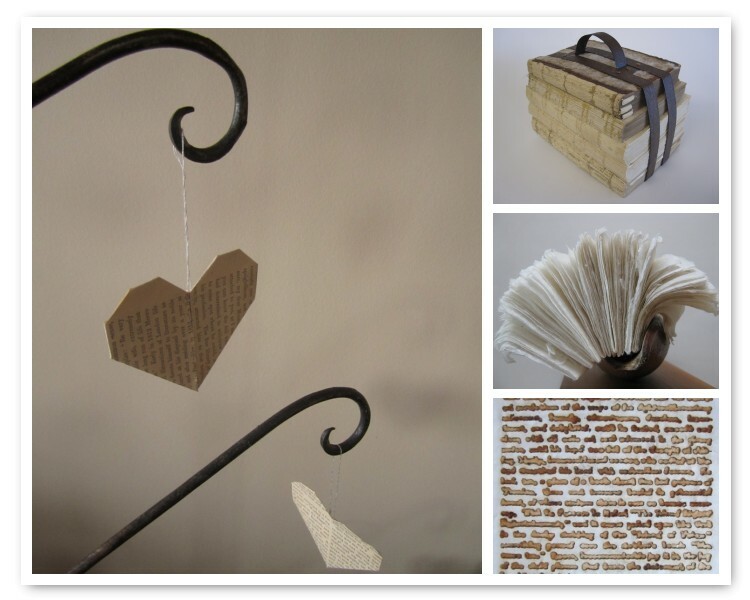 The other item of associated news is that we have been working with a friend of a friend to develop an online shop each as part of our websites where people could buy some of our work, and we are thrilled to say we are finally live! This will of course be a work in progress - what sort of things, what sort of prices etc, but its an important step for us and we look forward to seeing where it leads. If you ever see something that you like and it's not in the shop to speak, we now also have the capacity to make sales and receive money using paypal, so we can always explore options. My shop can be found on my website here, and some of Barry's beautiful pieces can be found for sale in his shop here. The Sunshine Coast Council, our local government, runs two major environmental art events. One year they hold "Floating Land" and the next year they hold "TreeLine". TreeLine celebrates trees, their stories and their important place in our communities. 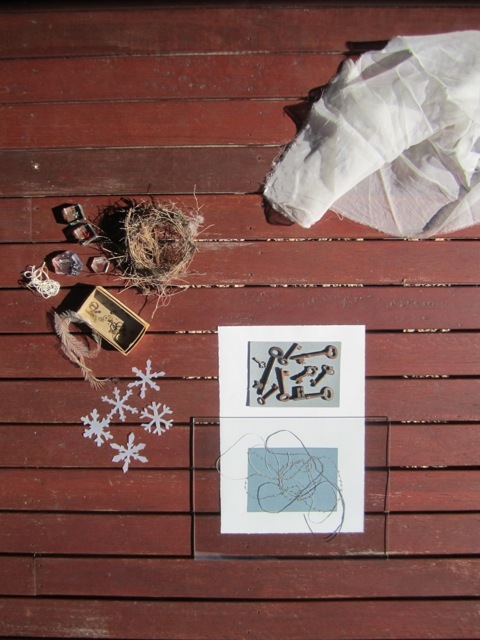 The Council selects feature artists whose work gets shown in their main galleries; and this year there is a TreeLine for kids focus being held at the Arts and Ecology Centre in the Maroochy Regional Bushland Botanic Gardens. I was fortunate to be selected as one of the feature artists for TreeLine for kids - primarily because of the way I often re-use books and incorporate old book pages into my artwork. 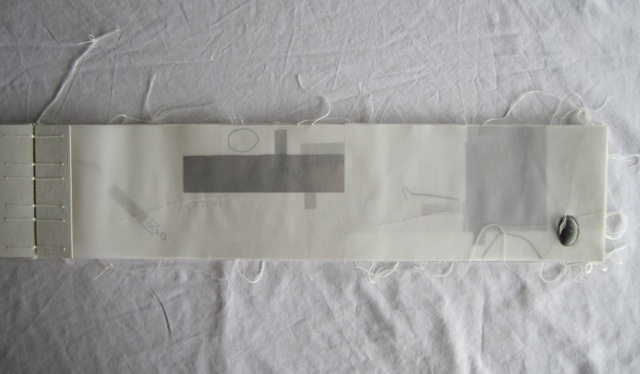 A few weeks ago the curator visited our house and the studio and selected the works to be shown. It was a fun afternoon as she ooh-ed and ahh-ed at bits and pieces around the place. The advertising is just beginning, but the official opening is on Thursday 14 June at 6.30pm for any locals who'd like to join us, and the exhibition runs from 16 June through to 8 July 2012. It will be a varied and different kind of exhibition - with a focus on encouraging children to think about how to re-use and recycle books to make art and things of beauty. 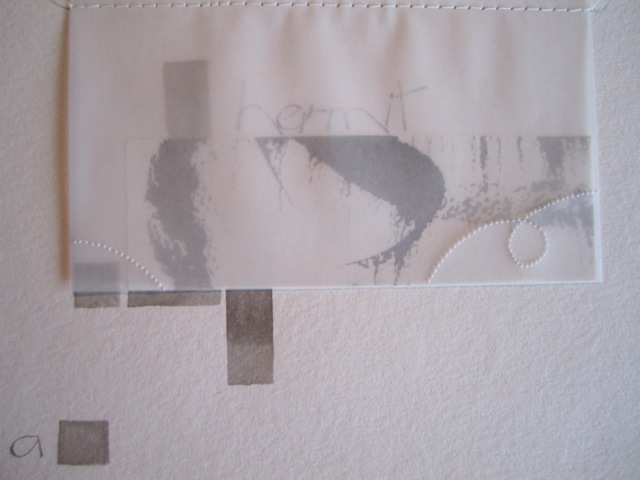 Barry will also have a few works on show which is great! 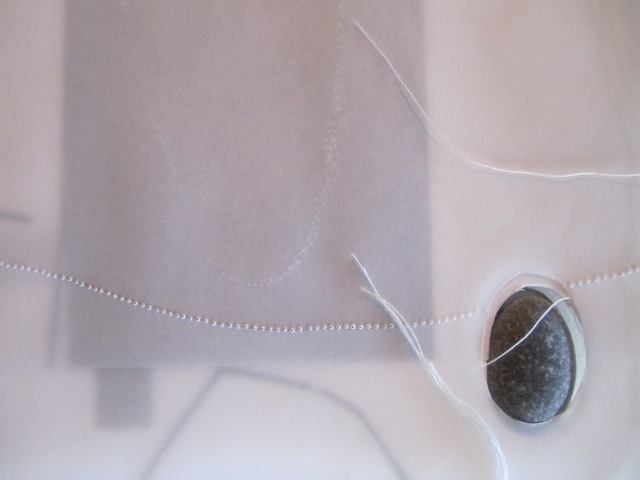 I will also be teaching a short workshop on my personal heartbeat script at the Arts and Ecology Centre on Wednesday 6 June from 10.00am - 2.30pm (for details please check my workshops page). I am looking forward to the opportunity to show works at the Centre - it is a beautiful building in a wonderful setting. We are having some of that perfect autumn weather - beautiful blue skies, clear nights, crisp mornings and sunny sunny days. The sort of weather that just makes you feel good. In amongst the odd saga (oven breaking when dinner party cooking needing to be done) I managed to get in and sort, organise, plan, wrap and finish some pieces - not necessarily in that order! 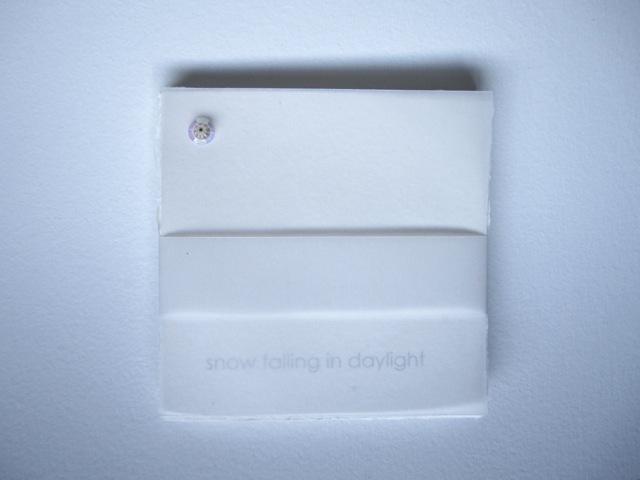 I have wrapped my little 'snow falling in daylight' book which is the second edition for BookArtObject for the year for me. 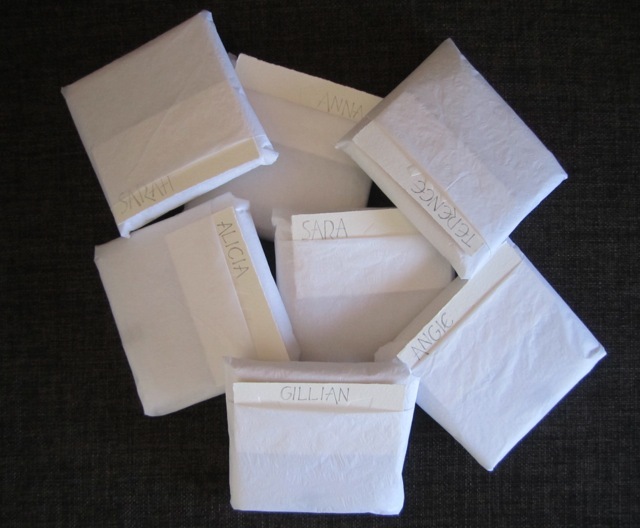 Tomorrow I shall pop them in the post, and then in about 10 days I'll be able to share their story more. We also have another COMA exhibition coming up. It seems to have come around rather quickly I must say. It is being held in our favourite book shop in town Rosetta Books, and the theme is the western zodiac. The show will run from 1 June 2012 - 22 June 2012. 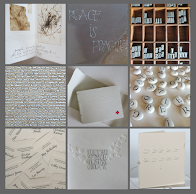 I felt it was necessary to make a book if the work was going to be in bookshop, so I have had heaps of fun and here are some more work in progress type shots. Anybody spot the little machine-sewing-on-paper addiction that is happening here?!? The book is well on it's way - needs some covers and a tie than it's ready to go. And I'm even early! I'm not sure I want to think that in the end my life will have been all about a massively long and frenetic to-do list (not that I don't love a list - I do). And so I stop and ponder how to make sure that the days breathe, have light and love and laughter in them and are a mix of the creative and the mundane. I have taken to writing in this little journal each night - despite searching the interweb widely I think it is no longer available. 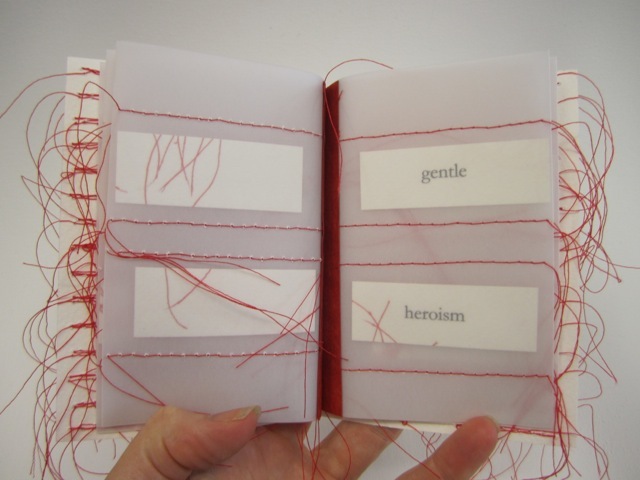 It is by Frank Chimero and is called "the being there diary' which simply asks you each day - "What was the very best moment of your day?" Firstly it makes me backtrack and replay the day so I remember so many things I did that I had already forgotten. Secondly, it makes me think of those moments when I giggled, sighed with wonder, smiled, laughed, felt uplifted, and all of those emotions are great to re-live. It also lets me focus on how it is often the small things that make magic in my day. A gentle reminder to me to make sure I have something to write in that journal every single day. 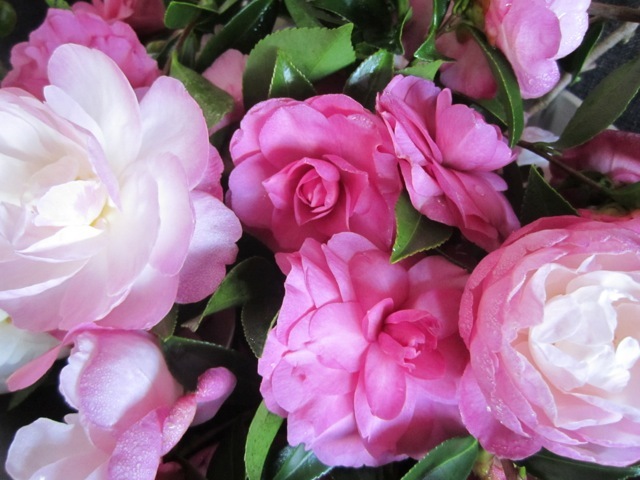 Camellias from the garden - a mass of delicate beauty. 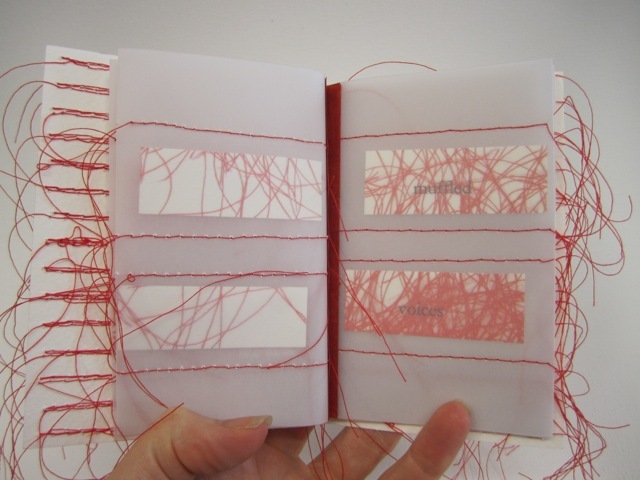 Well my editions for BookArtObject have been a'happening, and I surprised myself by packing up my first edition (A Subversive Stitch) and getting it into the post today (Tuesday). It is always such a good feeling to get the books on their way, travelling around the world and across the country to their new homes. I am beginning to receive books from here and there so its good to be able to reciprocate and get my books out to my other group members. 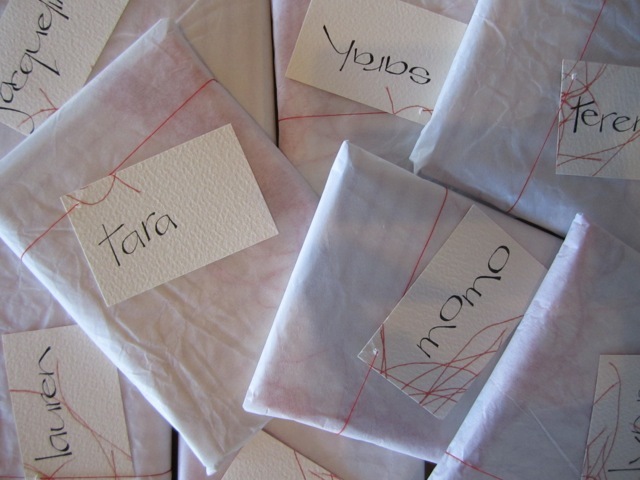 Here is a sneak peek of the packages and the labels all ready to go... I'll post properly on the book once folk have received their copies. Here are a few 'work-in-progress' type shots. 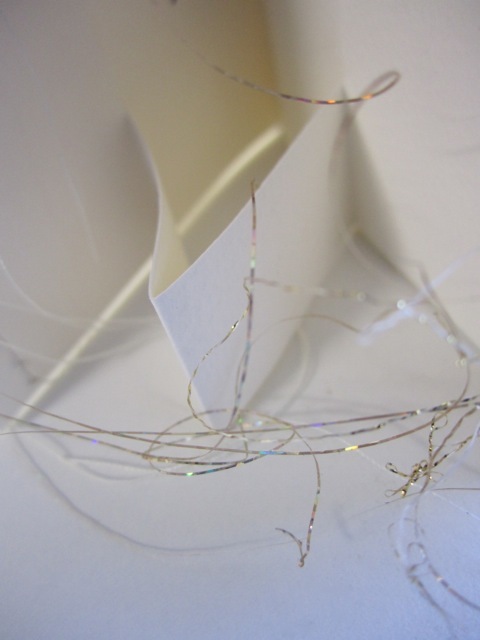 Stacks of creamy velvety Arches Velin paper. 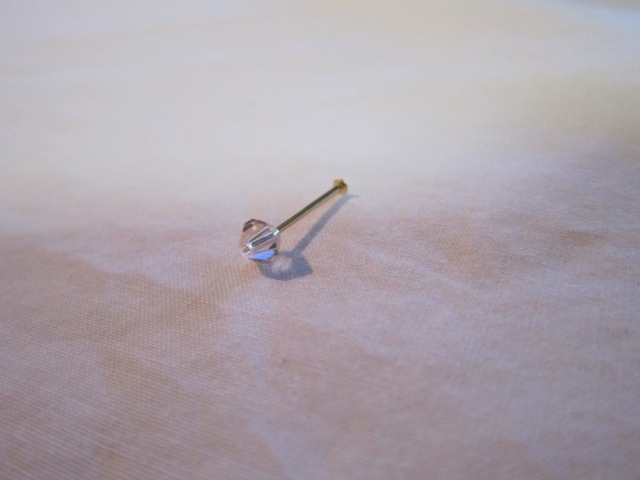 A Swarowksi crystal atop a brass post. 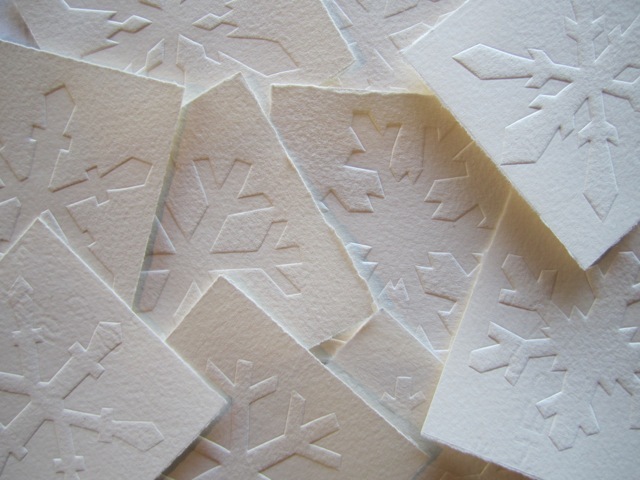 Stacks of snowflakes, embossed and debossed. I have pushed myself a bit further this time and tried to make editions of 20. We need about nine or ten for the group exchange, for the author to receive a copy and for there to be a copy for exhibitions etc. 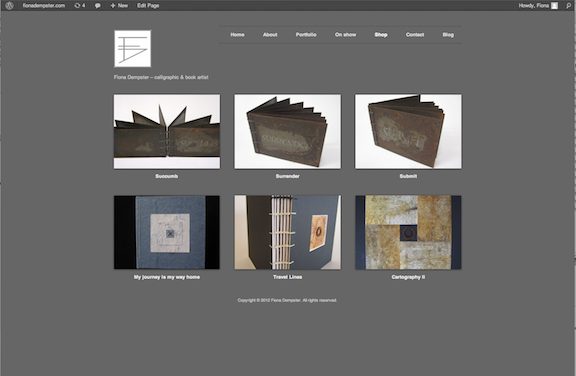 I always like to keep a couple of books for myself, and that means I will have a few extras to offer for sale at the Open Studios in September - October. 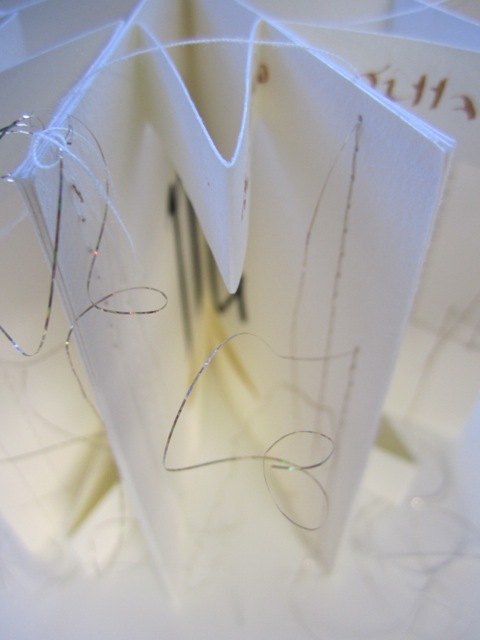 It has also been a challenge to produce two editions, and I am pleased that I have been able to develop ideas and processes which have meant two editions are possible for me. 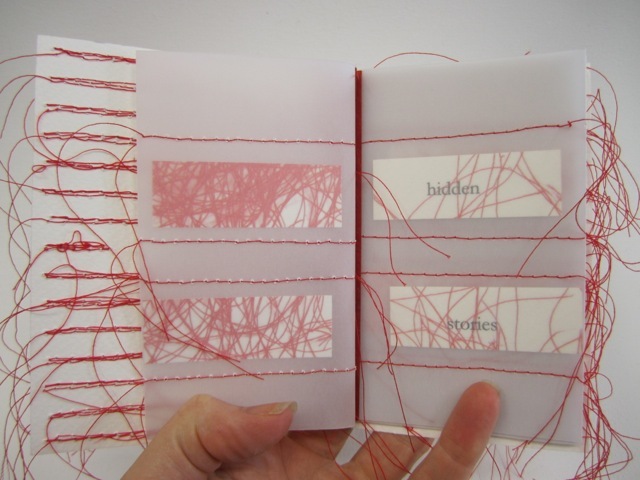 It is a great project to be involved in, not the least wonderful part being the receipt of other artists books to pore over, admire and enjoy. A little while ago we had some stunning sunny days and I thought to myself - the perfect opportunity to try out that cyanotype paper that I picked up in New York. 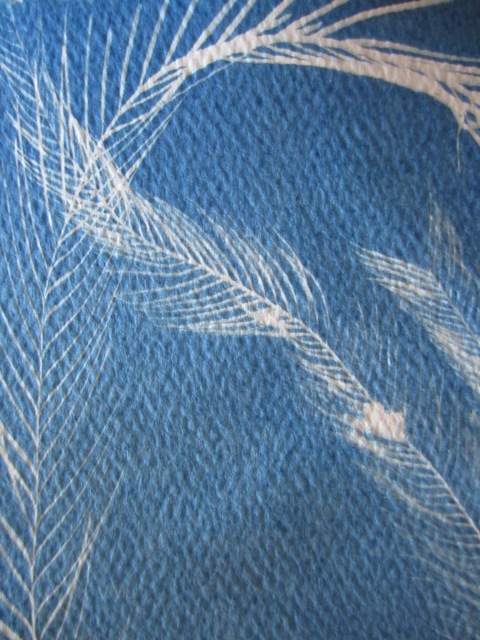 It's kind of like the slacker's guide to cyanotype as the paper is already prepared with the chemicals and you don't actually have to do anything much. 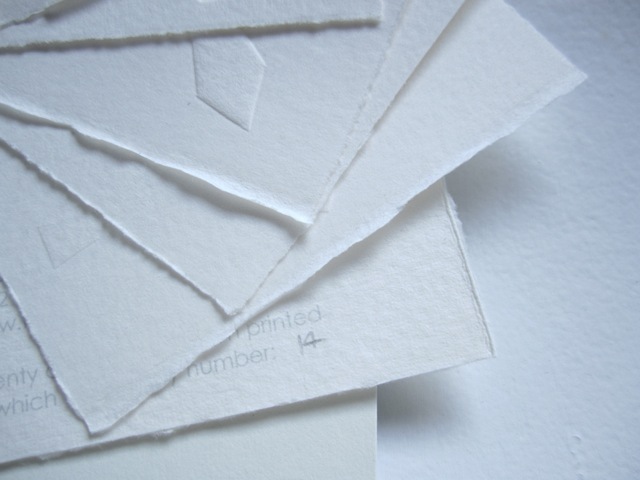 I must admit I love those moments of transformation that occur in art - the magic of lifting paper off a plate and seeing a print; pulling paper out of my rust mix and watching the papers dry. 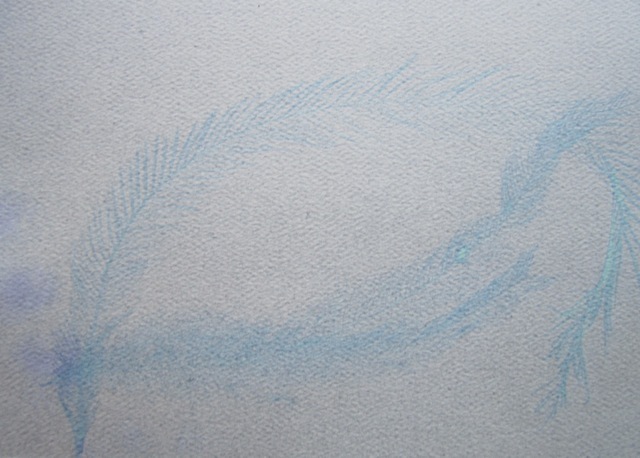 Wonderful stuff - so cyanotype is just the sort of thing I am likely to enjoy, alchemy at its best! This image shows some key just in the sun; and some Habu thread under glass. I think I need more Habu! And then after washing and drying, this is how they looked. So rich! 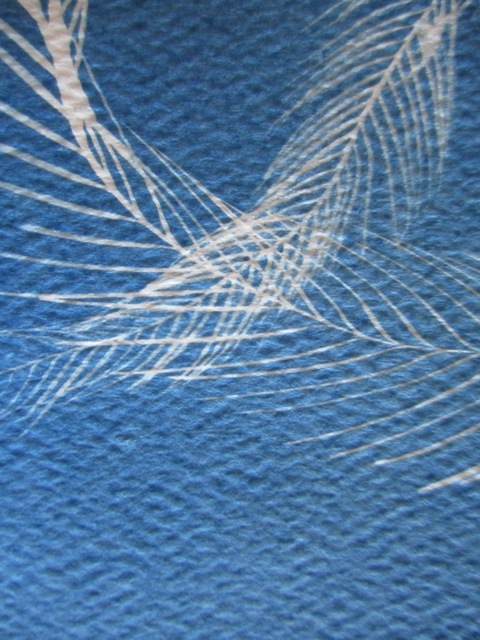 I love how as a technique it picks up really fine details - like the twists on the threads and the individual parts of the feathers. I quite enjoyed the whole thing and want to wash them again to see if I can create sepia tones and try a few other things. 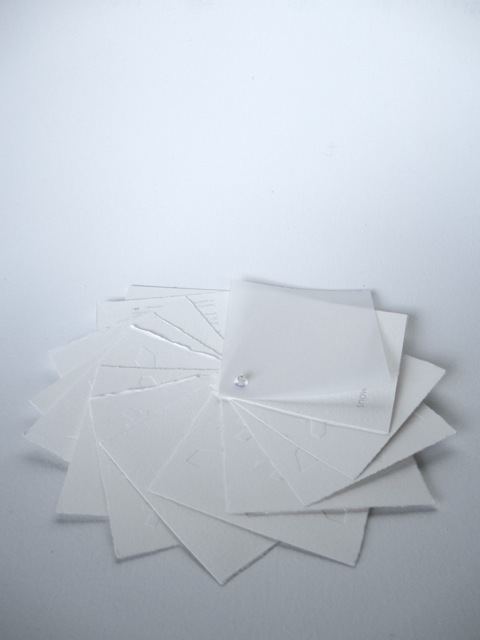 So far I think the prepared paper has worked fine; altho you are limited to the size it comes in. I'm not sure where this may go in my art-travels, but it was fun experiment to do on a sunny day. Our friend Mary Jane, who we met up with in New York (for the first time!) 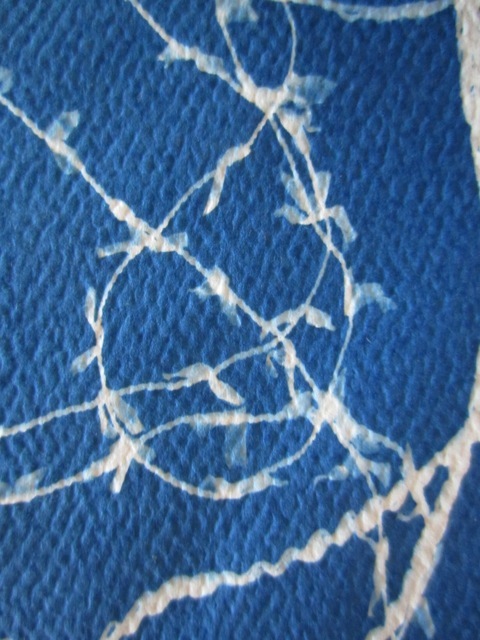 had a wonderful idea about artists making peace flags, hanging them on International Day of Peace on 21 September, taking photographs and sharing them on our blogs - a ring of peace around the world. 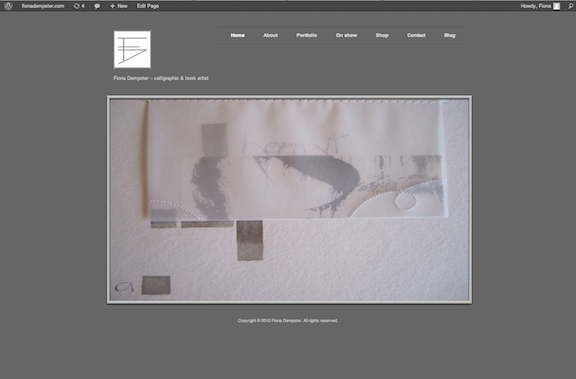 She has now taken it one step further and created a separate blog called flags for peace project 2012 where you are all invited to join in the project and make some flags to fly, or simply follow, or contribute thoughts on peace. 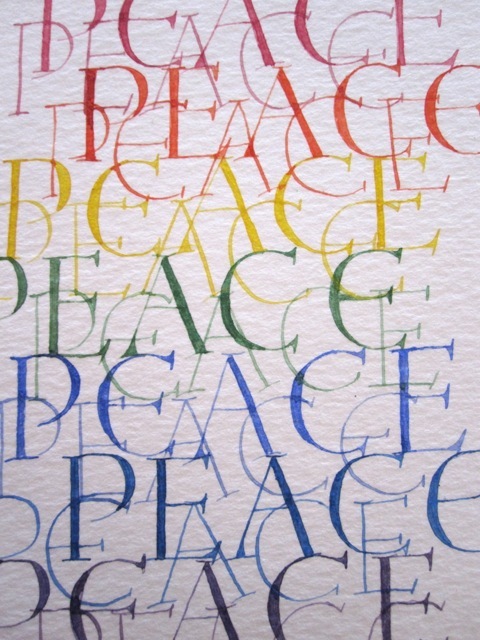 Mary Jane invites us all to create a ripple of peace throughout the world... and so we begin. "Nobody will stop you from creating. Do it tonight. Do it tomorrow. That is the way to make your soul grow - whether there is a market for it or not! The kick of creation is the act of creating, not anything that happens afterward. I would tell all of you watching this screen: Before you go to bed, write a four line poem. Make it as good as you can. Don’t show it to anybody. Put it where nobody will find it. And you will discover that you have your reward". Making art, being creative is a complicated double edged sword for me at times. The sentiment expressed here - about go make your art, go create and it's the act of creating that matters, is so liberating and freeing. And so very much how I felt thru the week as I was working on the book "Seeking Solitude" - it was the innocence of creativity, of expression, of working with your muse and your materials and working only out of the pure joy of making something beautiful. 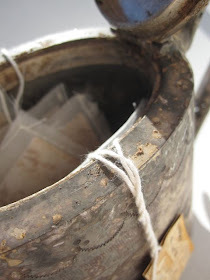 Like an essential oil - the purity of it was wonderful to experience. On the other hand, we do sometimes need to take note of what happens afterwards - where the piece goes, what was being made and why, who it is for, what you hope to achieve with it...and therein lies the conundrum. On occasions I also seek recognition by my peers that the work I do is worthy and quality work. Nonetheless I do agree with Kurt when he encourages us to just go do something. Make something. Write something. 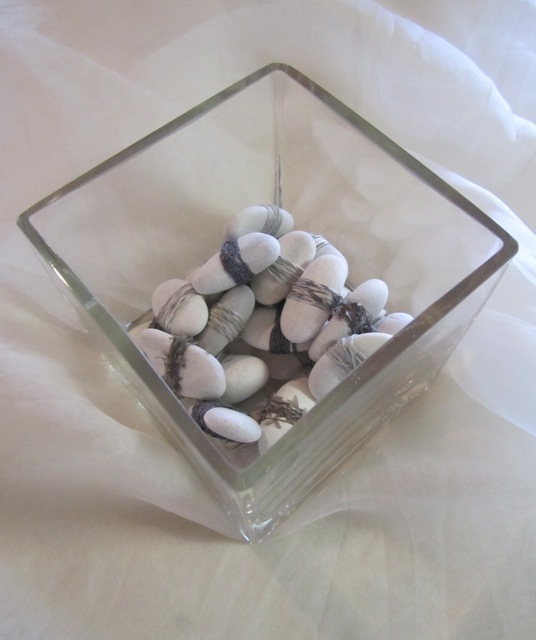 Even if it is simply wrapping pebbles...which I just love doing. As I began this book, I knew I wanted to challenge myself and push myself. I wanted to go places I might not normally go. Working with Susan gave me the confidence to get out there a bit more; she has such a beautiful eye and sense of design that I knew she would bring wonderful things to the collaboration to support my adventures (and rescue me if needed). 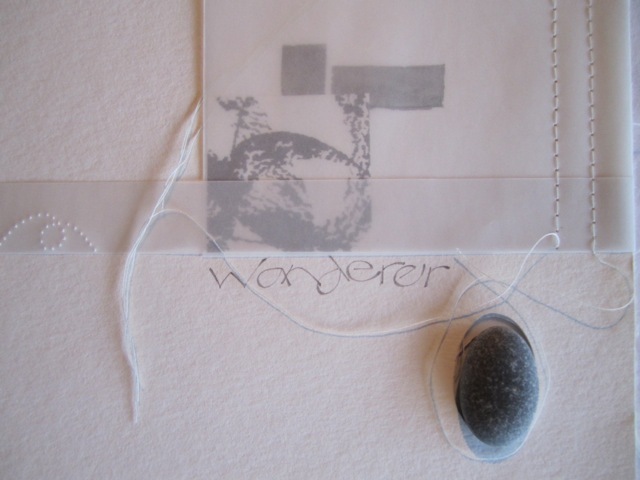 I also decided early I wanted to work with the hermit-wanderer words I had discovered a few weeks ago. This little truth about myself has become important to me and my understanding of self and I expect that I will work my way thru quite a few pieces that use it. Susan worked on four of the nine pages I had prepared. I had worked out I needed six pages to do the writing - by breaking up the text so that it flowed naturally over the pages. At the end of day one, that meant I needed to work out how to use her four pages and add in at least two more of mine. I ended up adding in four more of mine and a single sheet of tracing paper in the middle. I think that is one of the many differences between calligraphy and art. 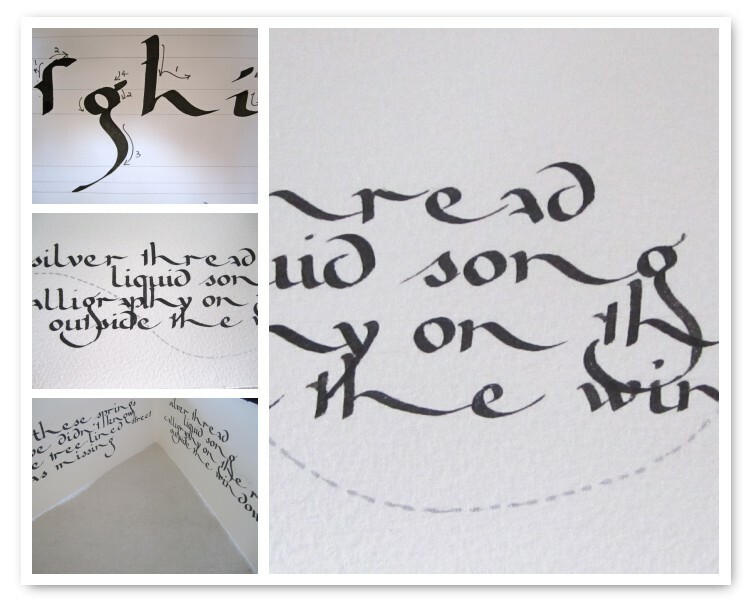 In a way, a book of art images doesn't have a pre-ordained number of pages; yet when I think calligraphy, I immediately work out how the text will flow and how many pages I need. 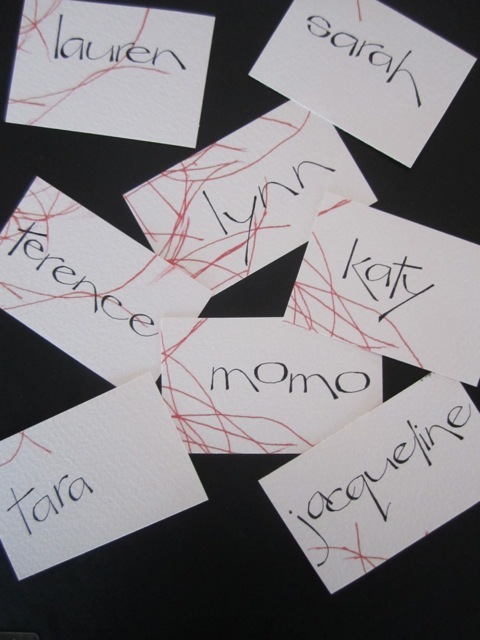 There is much more planning with calligraphy that in other forms of art I find. It was part of the process that I didn't tell her I had planned for six pages - we each wanted the other to respond as they felt they could to what we had presented. 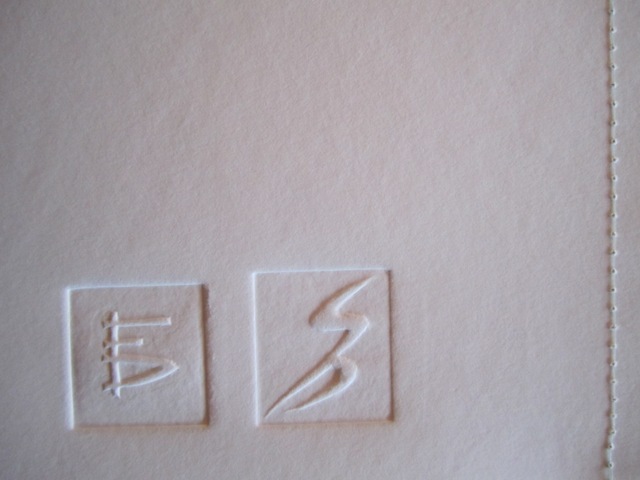 Like I initially felt I couldn't work into her etching pages. But in the end I did! The first and last pages are mine - with ink lines, and then other ink swirls added. 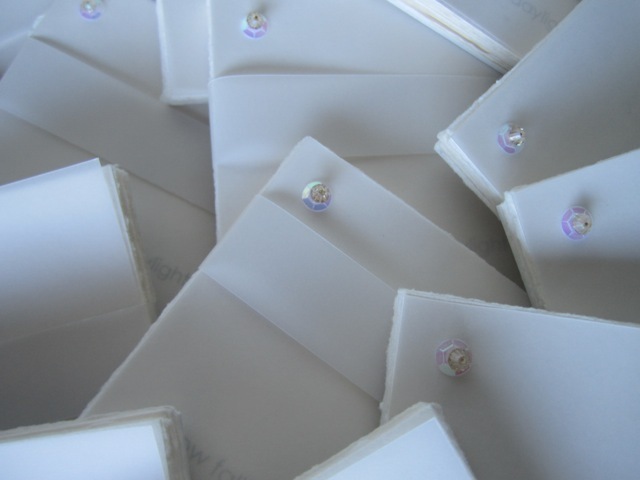 Each page is totally encased in tracing paper and I ran several lines of machine stitching through them. They are quiet and subdued. 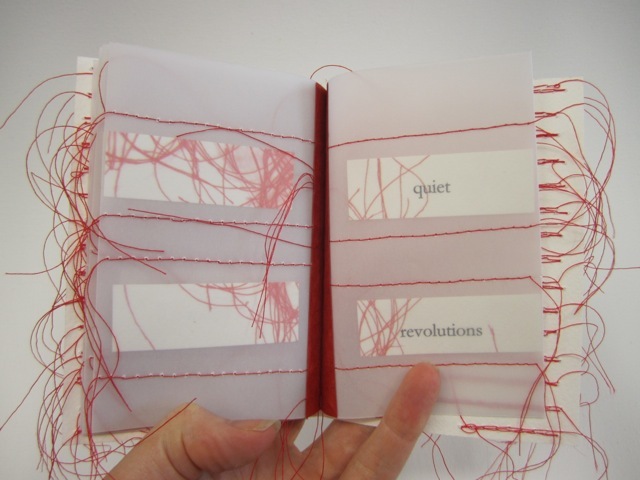 I then sequenced the pages the best I could to link Susan's pages to the words - to have the sense of rest and movement linked to the pages she had created. 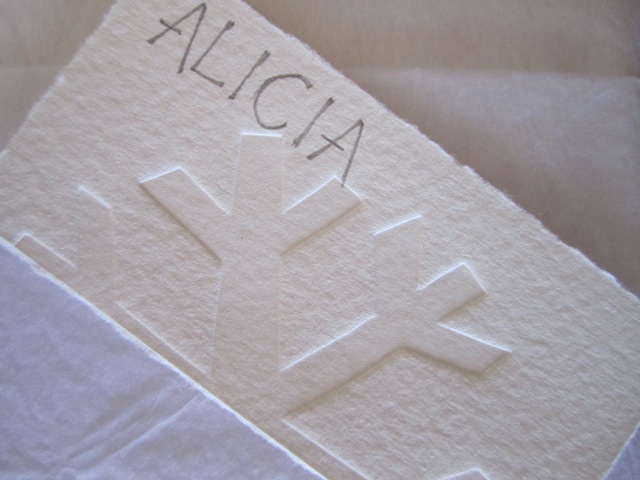 I also included two of my own pages in the sequence, and the single tracing paper page to mark the middle. 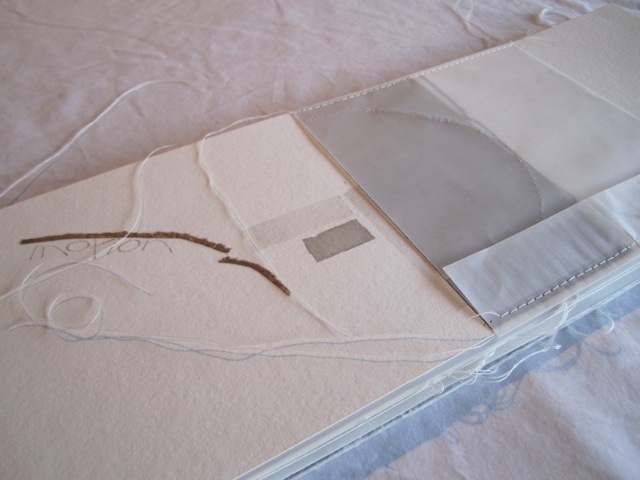 I decided to pretty much stitch down the tracing paper Susan included on her pages - each of her pieces is fully held; whereas the tracing paper on my pages is able to be lifted and moved around. A subtle differentiation between the two of us. It was interesting how I tried to bring my own voice back into the book and make these little decisions that in my head at least, meant that this bit was mine; this bit was hers. 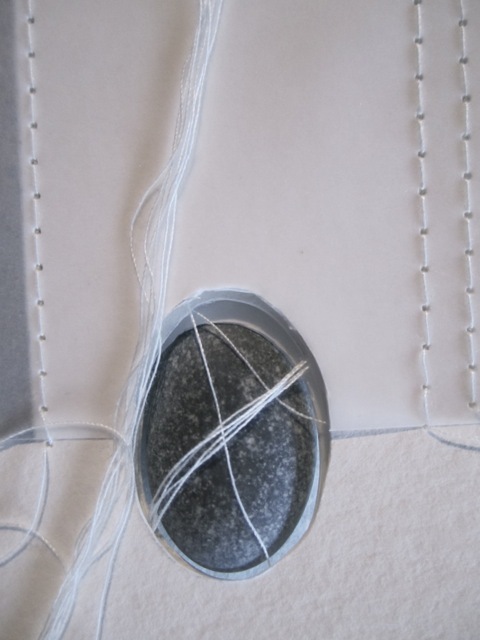 After chatting about a pebble - the one Susan saw had a "p" written on it, I wondered about which letter I would use, or would I use a blank white pebble or would I use a white pebble with a line across it, and would my pebble still fit when I had stitched the book together or would it be lost and would I need to find another pebble? 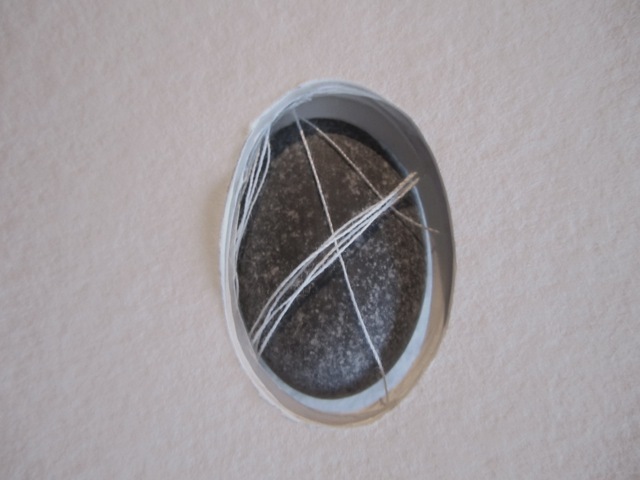 Would I grade the cut outs so that it looked like an excavation to get to the final pebble or would I cut all the holes the same size? So many questions and design decisions. About a pebble. I do love how the threads wrap over it and around it a times. Sigh. 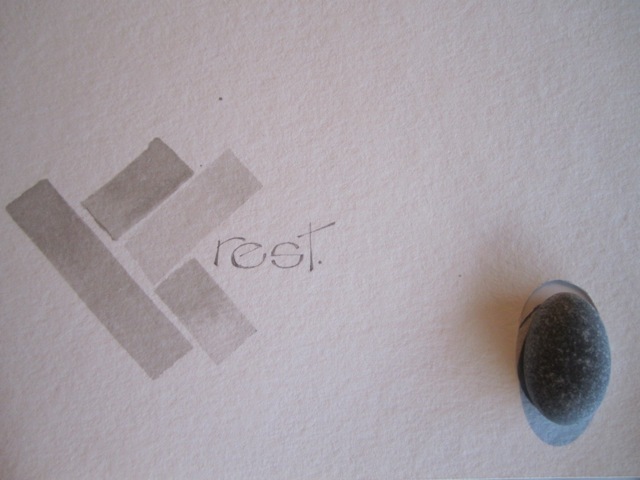 The book finishes with the line "at rest" and the pebble is a lovely little reminder of a quiet resting place, just as you finish the book. And we each embossed our marks into each book, but signed our books just ourselves. It's almost an impossible book to photograph so I will stick mostly with the details - but here are two pages - the entry page and another. I promise you I'll get over my infatuation and onto some new work very soon!